Holly Bell, ex Great British Bake Off finalist, author and mum to three boys, gets cooking with wholegrains. Read Holly’s fab blog post about wholegrains and healthy eating. 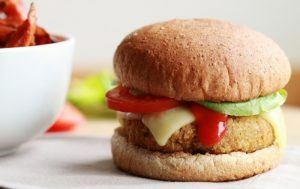 Holly creates a delicious Veggie Quinoa Burgers recipe for us, using lots of whole grains: quinoa, whole wheat breadcrumbs, wholemeal baps and brown rice.